Though we don't all go back to school in the fall, we can all use the changing seasons to inspire positive change in our daily routine. In this 'back to school issue,' I've included links to our resources on no-waste lunches and school recycling programs--but both are applicable to an office setting too. Try something new and enjoy the fall! Minnesota K-12 public schools generate an estimated half a million pounds of trash each day. And even with our best efforts to recycle and compost, the amount of garbage keeps increasing every year. The best way to change this pattern is to stop creating trash in the first place. 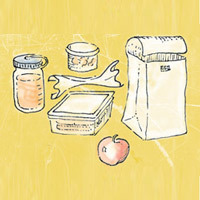 The new school year is a great time to recommit to packing a healthy, low-waste lunch for you or your kids. Read how to pack a no-waste in the full article. Fun, new ideas that I've come across include steel-cut oatmeal in jars, turning canning jars into lunch boxes, and using paper-based wrappers for foods in schools or workplaces that have organics recycling. 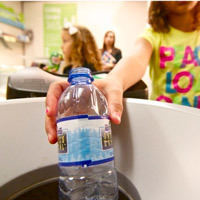 Are there recycling options at your school? Students, parents, and teachers can encourage their school to start or expand the recycling program. Twenty eight percent of school waste can be recycled. Add a composting program to your recycling program and more than 75% of school waste could be diverted from the trash! The Recycle More Minnesota Toolkit for Schools helps parents, students, or employees get a recycling program organized and operating successfully. The toolkit contains videos, case studies, worksheets and other resources. A recycling and composting program in Minnesota’s Independent School District (ISD) 191 is demonstrating how much more schools could be doing to divert trash from the waste stream. ISD 191 has instituted the program in each of its 15 schools — located in Burnsville, Eagan, Savage, Apple Valley and Shakopee — with the help of a member of Minnesota GreenCorps. The effort has already dramatically reduced the amount of district trash that ends up in landfills. Are you a parent of a high school junior? Now is the time your college search will start in earnest. Read what Minnesota Pollution Control Agency employee Jeff Ledermann and his daughter Katie learned as they tried to select a college that was a good fit for Katie and also committed to sustainability. This article was originally published on the Minnesota Association for Environmental Education blog. “Don’t stop the car,” pleaded my oldest daughter, Katie, as we drove around yet another college campus. At the time, we were only about halfway through the college search process, but after a half dozen campus visits she was finally starting to formulate some opinions. Unfortunately for the first several visits, they all started with “No.” It would take official visits to 14 different schools, another dozen informal visits, including the aforementioned drive-by, nine applications and letters of acceptance, anxious moments waiting for scholarship notices and lots of discussion on financial matters before her “Decision.” While Katie struggled to sort through the many options before her, a college’s commitment to sustainability was a priority for her from the start. 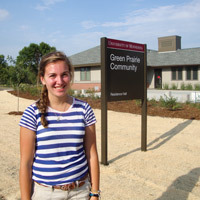 Having a father who is an environmental professional may have some influence, but many recent high school graduates share Katie’s priority that the college of choice needs to be “green”. The Princeton Review recently reported a “rising interest among students in attending "green" colleges. Among 7,445 college applicants Princeton Review surveyed in 2012 for its "College Hopes & Worries Survey," 68% said having information about a college's commitment to the environment would impact their decision to apply to or attend a school.” And colleges are responding. As someone who has been working many years to increase environmental literacy in the public, it was exciting to see firsthand how most college campuses have become bastions of sustainability. We found there are lots of ways to learn about the sustainability efforts of colleges. In addition to The Princeton Review’s green ratings and guide to green colleges, we found information from the Association for the Advancement of Sustainability in Higher Education (AASHE), the College Sustainability Report Card, Sierra Club’s Cool Schools ranking and Outside magazine’s college rankings all very helpful. While criss-crossing the Midwest by car and flying to the Pacific Northwest wasn’t the most environmentally friendly option, we found that actual campus visits were by far the best way to not only get a feel for the whole campus but really test the validity of a school’s commitment to sustainability. While most schools all now have some level of sustainability activities, when on campus it was easy to see which schools have really integrated green initiatives. From green dorm certification to signage in the dining hall regarding healthy local food options, we were most impressed by the schools that did a lot to engage and educate their students about their efforts. The number of schools adding environmental studies/science programs in recent years was also great to see. I’m a little worried about how all these kids will get jobs in the environmental field, but I am pleased to know that we are building a generation of better stewards. Regardless of their future careers, the environmental knowledge they are gaining now can be applied in any office, home or community. Just to be clear, however, I am encouraging Katie and other environmental studies students to get a second major or area of specialty. When it comes to earning a paycheck, it is good to have options. This fall, Katie joined her new classmates at the University of Minnesota Morris, one school that is truly committed to a renewable and sustainable college education. While there are lots of factors that go into choosing a college, I am proud that my daughter made it a priority to attend a green school. Free Hennepin Environment Choose to Reuse coupon books are valid October 1 – November 30. Coupons are for 80 local retailers throughout Hennepin County. Shopping reuse gets you great deals on quality products, plus it supports local businesses and protects the environment. This year's two-day Healthy Foods Summit, annually co-hosted by the University of Minnesota's Healthy Foods/Healthy Lives Institute and Landscape Arboretum, will focus on food and the environment, including the impact of climate and environmental changes on food production and, conversely, the impact of food production on the environment, October 14 & 15, The Commons Hotel (Minneapolis) and the Minnesota Landscape Arboretum (Chaska). Mark your calendar for the 8th Annual Green Gifts Fair, Saturday, November 23, 10 a.m.-5 p.m., Midtown Global Market (Minneapolis). Do you need a fall service or volunteer project for your community or youth group? A fun, easy, and high-impact project is to organize a group of volunteers to rake leaves from curbs, gutters, and storm drain grates in your community. The Freshwater Society makes it easy to do with these resources. Remember to keep leaves off the street outside your home too. Our lakes and rivers don't need extra leaves!